The truth about mornings is that they tend to be chaotic. With all the things that you need to do just to get yourself out through that door, there is little time for you to make yourself something that is too demanding. Standard quick options such as cereals, yogurt, and toast get boring fast, so there is certainly a craving to eat something more creative. 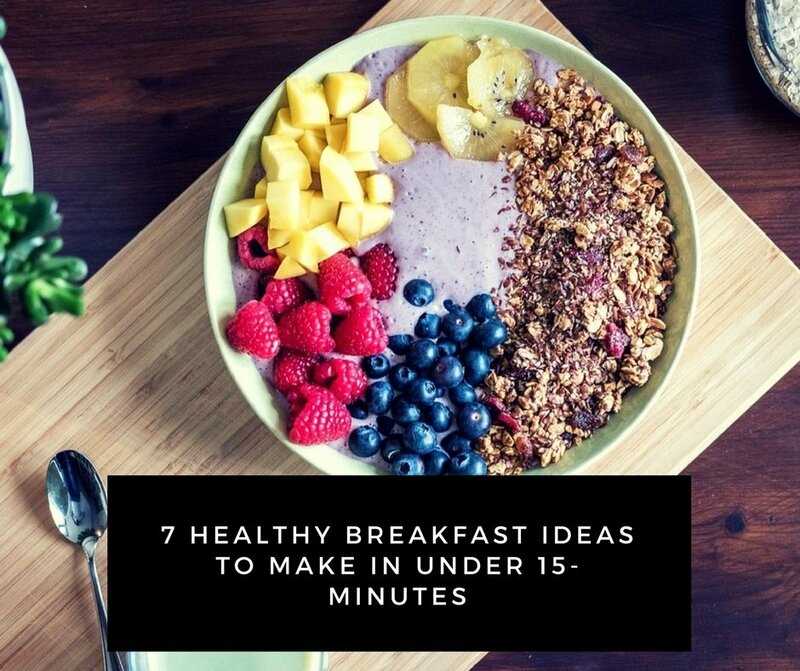 Worry not, because in this article I am going to teach you about 7 creative and healthy breakfast meals which won’t take you more than 15 minutes. If you don’t have the time for overnight oats, then this oatmeal-filled solution is the perfect choice for you. It doesn’t take long to make, and by using two bananas, you are making sure that your body gets a lot of potassium. Add vanilla protein powder to up the protein count to 30 grams. In order to make it perfect, add a bit of cinnamon on top, and you’ve got yourself the perfect morning smoothie for breakfast. 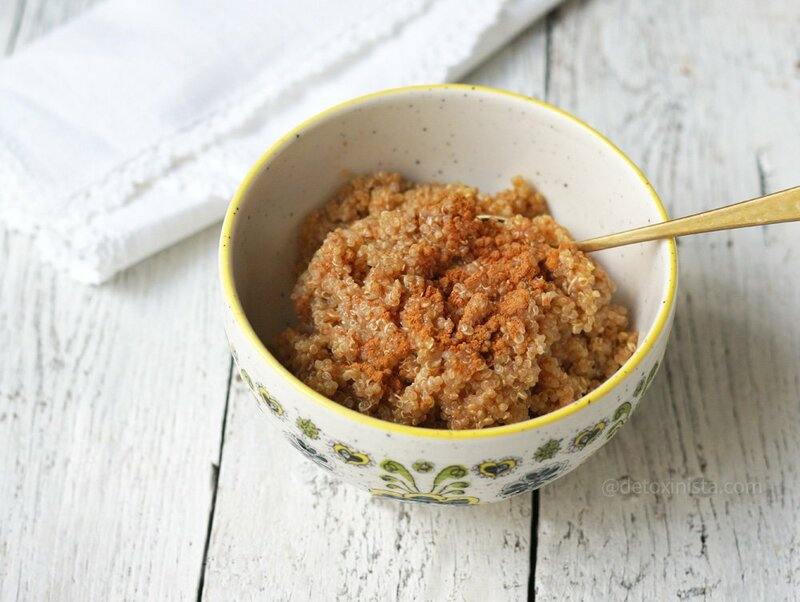 In the case that you have had enough of oatmeal and want to make a change, you can opt for quinoa as an alternate choice. What’s great about quinoa is that it’s full of protein and iron. Furthermore, it’s gluten-free, which makes it a great solution for those that are on a particular diet. What you need to do is cook a pot of quinoa just until it’s underdone, and then drain it. Add almond milk, peanut butter, and vanilla, and keep stirring. Remove it from the heat and add berries, nuts, and seeds. 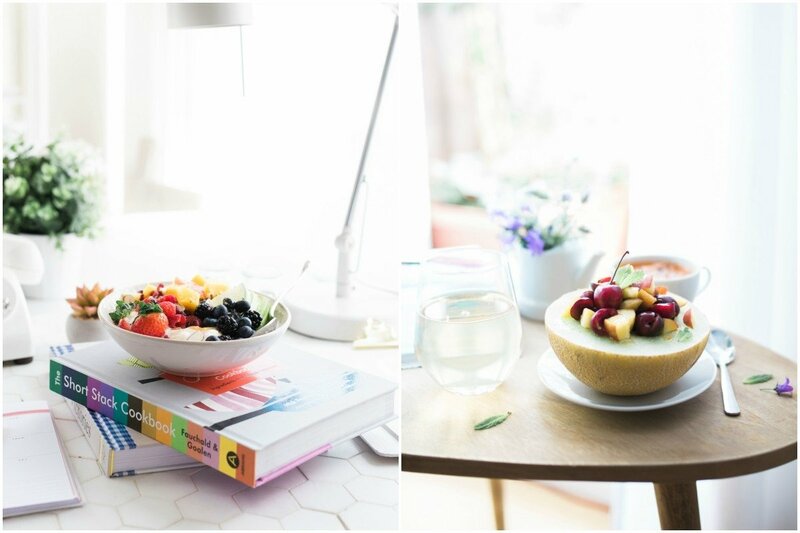 Add some of your favourite fruit on top, and you can enjoy a great and healthy meal. This low-calorie dessert is a better solution than blueberry pie. It includes more than a third of the desired daily value of calcium, as well as vitamin B-6, riboflavin, niacin, and folic acid. The total time that you need to make it is ten minutes. You need two types of yogurt (I went with low-fat blueberry and Greek yogurt), fresh blueberries, blueberry preserves, a bit of kiwi, and some graham crackers. Use a food processor to make the crackers crumbly. Then take a glass cup and alternately put in layers of yogurts, graham cracker crumbs, and preserves, until you fill it up. 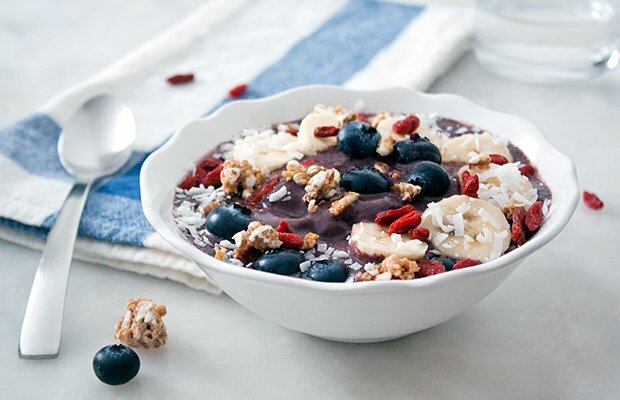 If you really want your mornings to pack a punch, you ought to try out this smoothie bowl recipe. What’s great about it is that it’s more substantive than a shake. 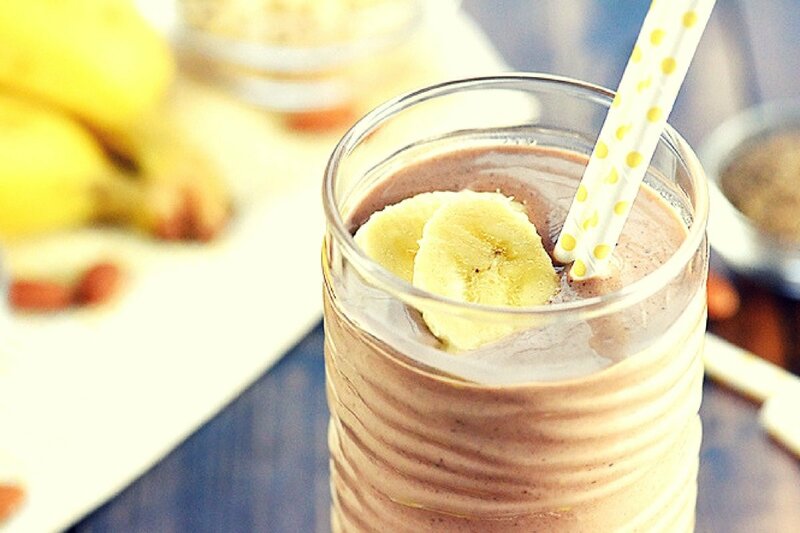 You need to blend almond milk, smoothie packs, and half a banana. You should top this great meal with granola or high-fiber cereal, and add banana slices for that dose of potassium. You should know that acai is full of fiber, antioxidants, and fats that are healthy for your heart. Blend it, mix it, and you’re good to go. This recipe requires only about five minutes to make. Almost everyone is a fan of pancakes. The only problem is that they aren’t exactly the healthiest breakfast idea out there. 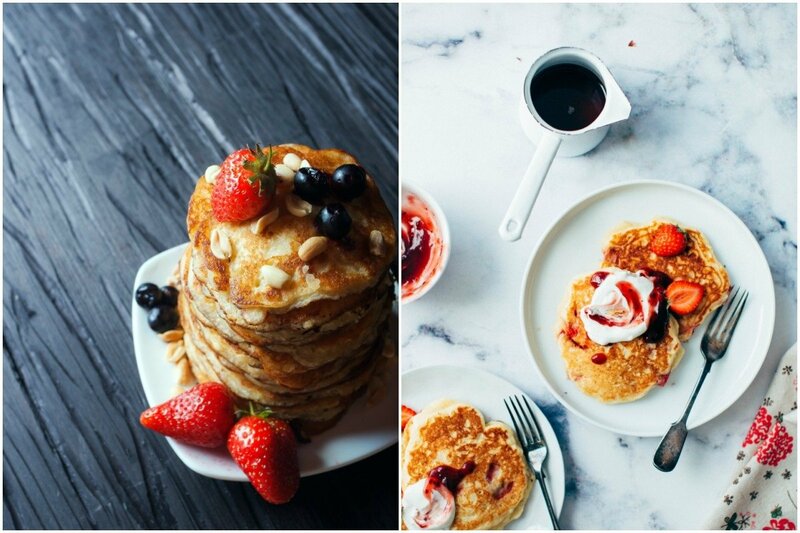 Lucky for you, there is a much healthier solution than regular pancakes. All that you need to do is mash a banana with a fork, add two eggs, spice it up with a bit of cinnamon, and you’ve got yourself amazing sugar-free pancakes. In order to take up even less time, you can make your pancakes out of casein protein powder. It’s a slow digesting protein source, which means that you can eat it at any time, even before bed. With this great protein smoothie, you get to kill two birds with one stone. Next to being a filling meal, it also includes sweetened java which is bound to boost your stamina. It is an absolutely fantastic solution for early-hour workouts. 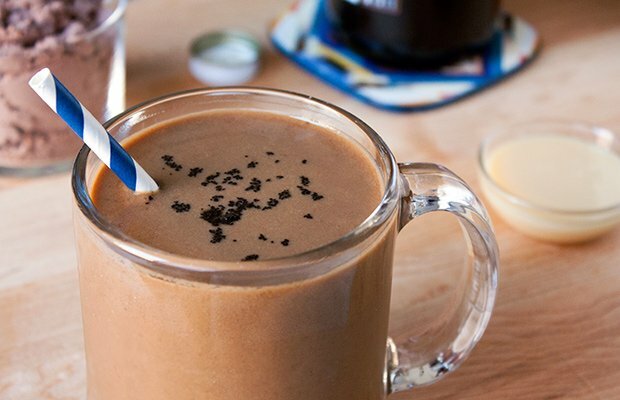 You need to mix unsweetened almond milk, cold chicory coffee concentrate, chocolate protein, two teaspoons of sweetened condensed milk, and half of a sliced a banana. Before you go for that sweat session, take a sip of this smoothie in order to get that coffee-generated buzz, as well as to boost your endurance during your training. The total time you need to make it is five minutes. This fruit salad is a brilliant breakfast choice, as it’s packed with antioxidants. They are very important for your health, and can be found in summer fruits like berries, peaches, plums, and cherries. The salad is even more nutritionally rich because it includes bee pollen and vanilla infused honey. 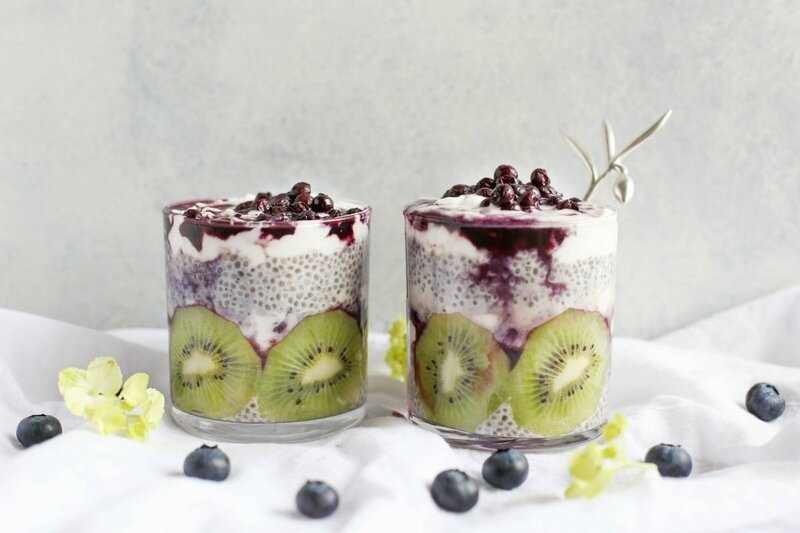 What you need to make it is blueberries, blackberries, sliced plums and peaches or nectarines, 1-2 teaspoons of bee pollen and 2-3 tablespoons of vanilla infused honey. First you need to make the honey by splitting the vanilla bean down the center. Scrape the inside with a small spoon, and blend it into honey. After that, all you need to do is prepare the fruit in a bowl, and top it with the honey and bee pollen. Make your mornings nutrition-full with these 7 healthy recipes. They take less than 15 minutes to make, and are a better solution than some of the other quickly made breakfast meals.